Accommodation provided on Twin sharing basis. The Half day sightseeing in Non A/C Indica Car. Children below 8 years, sharing same accommodation are complementary. This Package is valid only for Tourist Couples and Check in has to be done on Saturday and Check out by Monday. 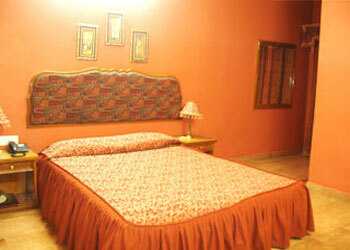 Hotel Kalinga provides nice accommodation facilities at affordable rate. The hotel is centrally located and is located less than 1 km from Jodhpur railway station and just 7 kms from Jodhpur airport. The hotel provides well appointed air-conditioned rooms which are spacious with attached bathrooms and all types of modern facilities to make your stay comfortable and enjoyable. Hotel Kalinga offers a multi-cusine restaurant serving Rajasthani, Indian, Chinese and continental food, a well stocked bar, a swimming pool to relax, gymnasium, and more. Travel desk available. All major credit cards available. Jodhpur by pass road, Pal village, Jodhpur, Rajasthan, India. The Full day sightseeing in Non A/C Indica Car Rs.300/- is extra.